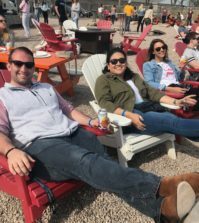 Three seniors have teamed up to improve relations between Quinnipiac students and families living in Hamden. 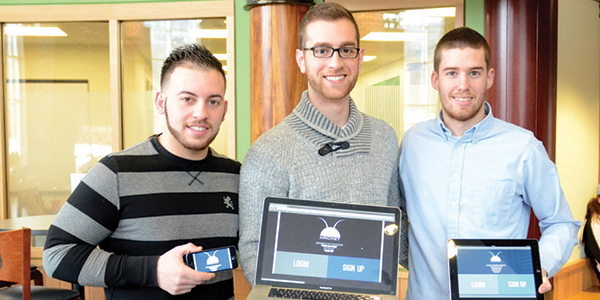 Connor Croteau, Stanley Martone and Thomas Nassr are the co-founders of Kricket, a new web application which allows neighbors to notify students that they are being too loud through an anonymous text message. They launched the app for beta testing on Saturday, March 1. Sending a Kricket is an intermediate step one can take before calling a resident assistant on campus, or the Hamden Police Department off campus. With these courtesy texts, the co-founders aim to avoid police involvement and improve relations between university students and the families in the area. 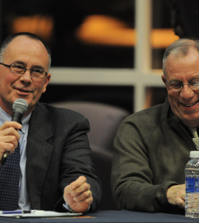 “It alleviates a lot of stress from the neighbor if they have this good relationship with their neighbor, with Quinnipiac students or even if it’s on campus, with fellow peers,” Martone said. Since the product launch, the Kricket team has recruited 60 houses not owned by Quinnipiac, and 52 off-campus Quinnipiac-owned houses are also in the process of signing up, Croteau said. Senior Tim DiMauro and his housemates signed up for the service. They live off campus and are surrounded by both families and couples, but they have never had problems with their neighbors, he said. Senior Jackie Pegno lives on New Road next to students, and says she has never had a problem with noise. She thinks the web app will be more relevant for students who live near families. The co-founders have prior experience as entrepreneurs through their initial venture together, Rate and Rent. It is a website service that allows students to rate their landlords, find a house and pay rent online. Though they started developing Rate and Rent last year, Kricket is the first product they have officially launched. “We noticed there was a problem with the university and the town and off-campus housing making a disruption in the community,” Croteau said, referring to this academic year’s slew of busted off-campus parties. In October, several students were arrested for breach of peace. Thirteen students were cited for creating a public disturbance in off-campus housing. “We kind of put Rate and Rent on hold and decided to solve this problem,” Croteau said. The co-founders got Kricket going in less than a month, using connections they already made and resources they have garnered during the past year. Students can register a house on the website by providing an email and phone number. The website tracks a user’s current location, so users can only send the text while in the registered house to avoid abuse of the service. Once a student signs up, representatives from the Kricket team go around to neighbors and offer the service. For now, the service is free. Croteau, Martone and Nassr are working with Residential Life and other organizations to market the product. As of now, Kricket is self-funded by the three students, and they plan to offer the service to Quinnipiac students for the rest of the year for free. When it picks up, they plan to expand the service to other schools. “We like to say Florida State produced Gatorade, Harvard produced Facebook, and we want Quinnipiac University to produce Kricket,” Croteau said. But before Kricket can expand nationally, they plan to create more of a presence at Quinnipiac. As an RA on campus, Martone said campus housing is a big market, and they will begin to target these residents starting next month. Each neighbor is allowed three Krickets an hour, or six every 48 hours, Martone said, and no customization of messages will be allowed.